I don't quite get what Dame Dash is up to these days. Making movies and clothing and opening up a restaurant and living on the West Coast, I think. His Instagram makes it seem like he has some sort of polyamory thing going on. There's a lot to unpack. But we're not here to parse those things. We're here to talk about his adorable pack of dogs, which he refers to as "emotional support dragons." Dame has three dogs: Dusko, Governor, and Cookie. They are with him basically all the time, whether he's chillin' in the studio or chillin' by the pool, as you can see from their well-maintained Instagram account. Dame is a Dog Guy, and his dogs are very cute. See? First up is Dusko. Dusko, Dame's first dog, is a yellow lab and a very handsome one at that. He has a great dog smile. A few months ago, Dusko was joined by Governor, aka Gov, an adorable French Bulldog. The iPhone provides a good size reference for how tiny of a guy Gov was when Damon adopted him. But because Champagne Dame is a big softie, and because he believes in the philosophy of No Dog Left Behind, it wasn't long before he went back and adopted Gov's sister, who he named Cookie. These are some good dogs. They accompany Dame and his family and his apparently all-female crew everywhere. 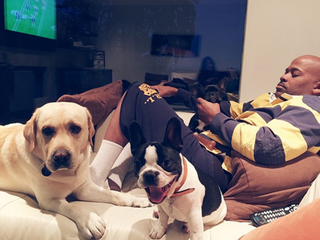 Damon Dash is a dog guy. Just remember that when you think about Damon Dash. Making deals with a sweet little puppy on his lap. Eating a sausage on a stick with his yellow lab in tow. Doing a couple of errands at Home Depot with a canine companion. These dogs eat well. These dogs travel. These dogs wear hoodies when weather permits. These dogs have good lives. They go everywhere. Damon Dash is a good dog owner.